We have our first brave souls crossing the ice! I spoke to them when they got out there and they reported 4″ most of the way across, and 3″ where they setup. Make sure that you are using a spud. 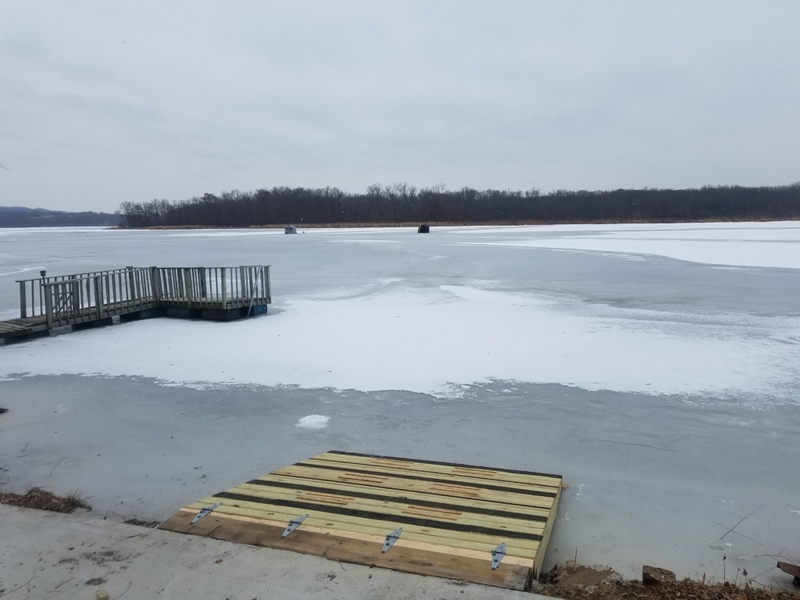 As you can see I have the ramp installed so you can now access the ice from my parking lot on foot or with an ATV/UTV (ice permitting). Not a ton of new information only I watched a guy try and spud farther out from the landing towards Rosebud and did not get far before turning around. Long term the forecast looks promising but the next week or so we are not going to be adding a ton of ice. Here is where we are at this morning. 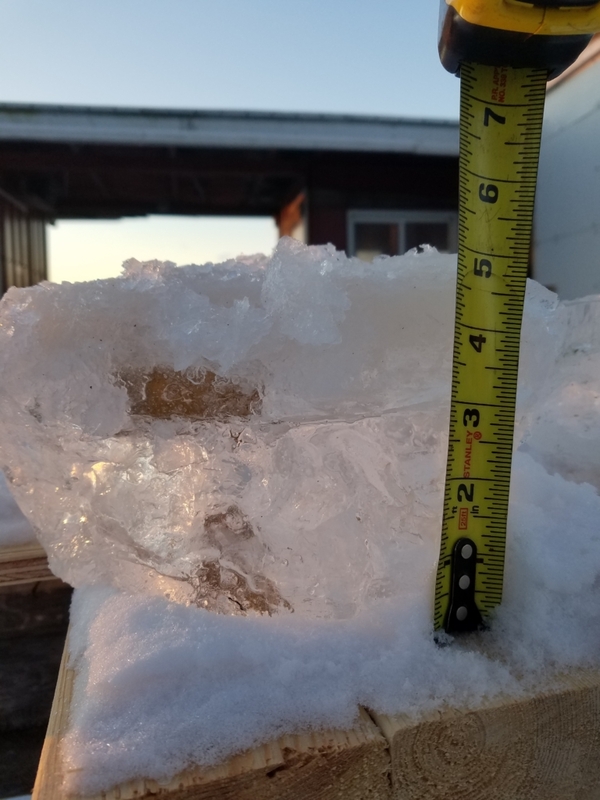 3″ of clear ice, with some cloudy ice on top of that. This is just off of the docks, ice may be thinner farther out. Please be careful!!! I am getting more reports of people fishing, as well as someone going through the ice on Fishermans Road. From what I have heard there is 2 1/2 to 3 inches in Airport bay. Please be careful. In front of the shop we have about the same amount close to shore, but there is a 100 yards long by 50 yards wide spot about 50 yards off of the landing that only closed up this weekend. There were people fishing right around the docks at the landing, but it will take some time to thicken up out farther. Be patient there will be plenty of ice in the near future, its not worth going for a swim. Just a quick ice update. I heard from guys yesterday that people are fishing round lake/mud lake in Trempealeau. I also heard there were guys fishing south of Goose Island. I’m not sure if anyone tried Airport Bay yet this morning, but as of yesterday there was not anyone out there yet. As far as in front of the shop for whatever reason it is struggling to close up. There is still open water 50 yards out from the boat landing and a good chunk open south of Halfway creek. I have no idea why we have had plenty of cold weather that should have locked it up. At this rate it will be another week before anyone is able to get out here. I will update the report as conditions change. I am fully stocked with live bait and have an expanded plastics section as well as some new tungsten, so stop in and get loaded up!